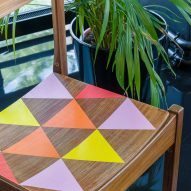 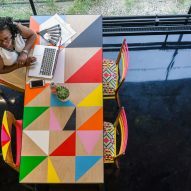 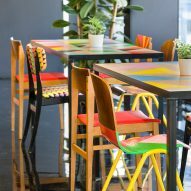 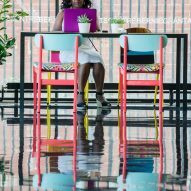 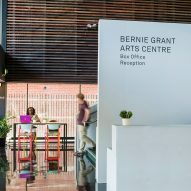 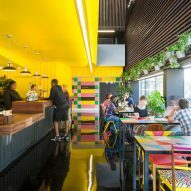 British designer Morag Myerscough has created brightly coloured textiles, tiles and furniture for the cafe inside the Bernie Grant Arts Centre in London, which was designed by architect David Adjaye. 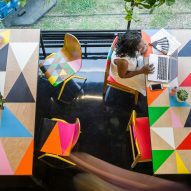 The space's interior has been stripped back and renovated as part of a wider refurbishment of the David Adjaye-designed building, which opened in 2007 and offers workspaces and rehearsal rooms. 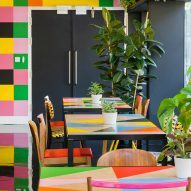 For her intervention, Myerscough wanted to express the "exuberance and enthusiasm" of the cafe's staff, and did so by covering the walls and furniture in bold geometric patterns she has come to be known for. 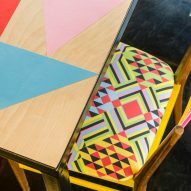 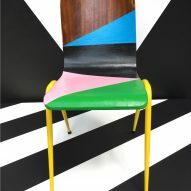 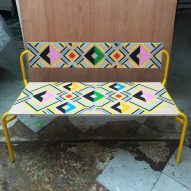 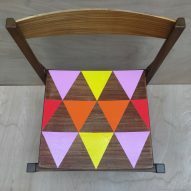 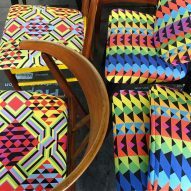 The designer updated old furniture by different sections in contrasting, vibrant hues, as well as creating new pieces using reclaimed materials in partnership with artist Luke Morgan. 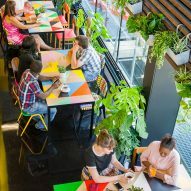 "Over the years the original intent of the cafe had got lost, and various layers had been added to the cafe and the whole building," she said. 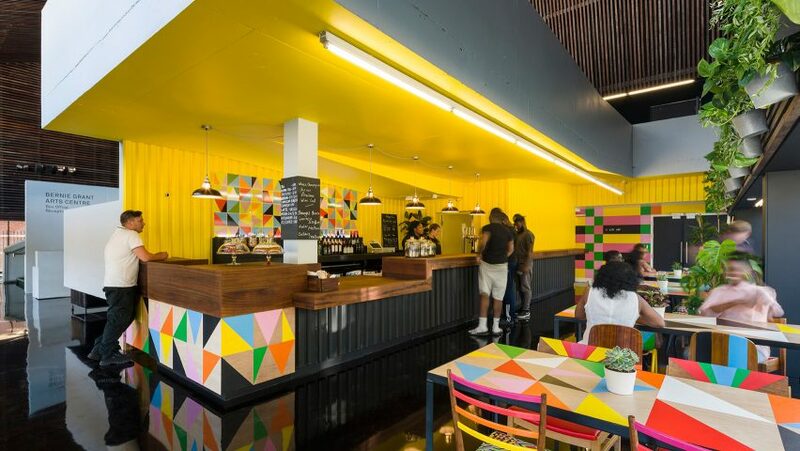 "The cafe is run by an amazing local woman, Gina Moffatt, and it felt really important that the café had the exuberance and enthusiasm she gives to the place, full of colour and life." 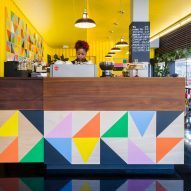 Myerscough had to work around the space's existing built-in concrete elements, such as the bar – which she clad in Iroko wood to add warmth while also echoing the building's original wood panelling. 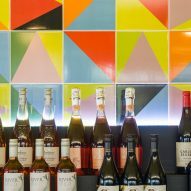 Ceramic tiles behind the bar repeat triangular patterns seen elsewhere in the cafe, and Myerscough has also added dozens of plants as well as designing patterned textiles for the cafe's seating. 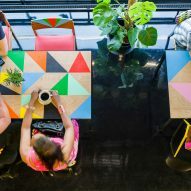 "The repurposed furniture brings the domestic and familiar to this grand space and the large tables encourage conversation between visitors," she added. 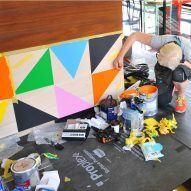 As part of the centre's commissioning programme, Myerscough also created new spaces for fellow artists to make their mark and add their own "layers and textures" to the building. 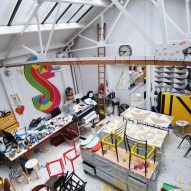 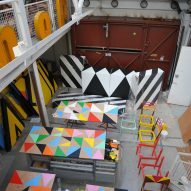 Morag Myerscough established Studio Myerscough in 1993 and has since developed a reputation for designing large-scale graphics for interiors, often working with colour and pattern. 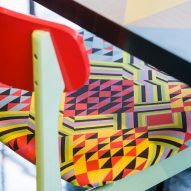 Projects include designing cheerful interiors for Sheffield Children’s Hospital, and a colour and letter-filled architectural installation for London’s Southbank Centre.